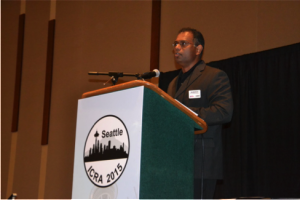 Dr. Raj Madhavan at the ICRA 2015 in Seattle, Washington. Raj Madhavan is currently a Distinguished Visiting Professor of Robotics with AMMACHI Labs at Amrita University, Kerala, India and the Founder & CEO of Humanitarian Robotics Technologies (HumRobTech), LLC based in Maryland, USA. He is also the Co-Chair of the International Conference on Robotics and Automation for Humanitarian Applications (RAHA 2016). He has held appointments with the Oak Ridge National Laboratory (March 2001-January 2010) as an R&D staff member based at the National Institute of Standards and Technology (March 2002-June 2013), and as an assistant and associate research scientist, and as a member of the Maryland Robotics Center with the University of Maryland, College Park (February 2010-December 2015). He received a Ph.D. in Field Robotics from the University of Sydney, an ME (Research) in Systems Engineering from the Australian National University, and a BE in Electrical and Electronics Engineering from the College of Engineering, Anna University in 2001, 1997, and 1995, respectively. Over the last 20 years, he has contributed to topics in field robotics, and systems and control theory. His current research interests lie in humanitarian robotics and automation — the application and tailoring of existing and emerging robotics and automation technologies for the benefit of humanity in a variety of domains, including unmanned (aerial, ground) vehicles in disaster scenarios. He is particularly interested in the development of technologies and systems that are cost effective, reliable, efficient and geared towards improving the quality of lives of people in under-served and underdeveloped communities around the globe. Dr. Madhavan has edited three books and four journal special issues, and has published over 185 papers in archival journals, conferences, and magazines. He has served as an invited independent judge for robotics competitions, has given numerous invited presentations in research organizations in several countries, has served on editorial boards and program committees of premier robotics, automation, and control conferences, and on several national and international panels and review boards. He is an elected eminent Engineer of the Tau Beta Pi (University of Maryland Chapter), a full member of the scientific research society, Sigma Xi (NIST Chapter), and the Washington Academy of Sciences. He received two best paper awards as a PhD candidate from IEEE Region 10 and was the Graduate division winner of the SME Outstanding Student Paper Contest in 1998. Within IEEE, he was the Founding Chair of the IEEE Washington/Northern Virginia Section Robotics Automation Society (2007- 2009; 2010 Best Chapter of the Year Award) and Sensors Council Chapters (2008-2009). He is a senior member of IEEE and is currently active within IEEE in the following roles: Member, TAB Future Directions Committee & Chair of the FDC Initiative on Autonomous Systems and their Societal Impact; Vice Chair, Assessment & Best Practices, Humanitarian Activities Committee; Member, SIGHT Steering Committee; Chair, Partnerships Subcommittee, SIGHT; and Co-Chair of the Economics of Machine Automation and Humanitarian Activities, IEEE-SA Policy Advisory Group on AI & Ethics. Within the IEEE Robotics and Automation Society, he served as the Founding Chair of the Technical Committee on Performance Evaluation and Benchmarking of Robotics and Automation Systems, TC-PEBRAS (2009-2011), Founding Chair of the Humanitarian Robotics and Automation Technology Challenge, HRATC (2014, 2015), Vice President of the Industrial Activities Board (2012-2015), Chair of the Standing Committee for Standards Activities (2010-2015), and since 2012 as the Founding Chair of the Special Interest Group on Humanitarian Technology (RAS-SIGHT). He is the 2016 recipient of the IEEE Robotics and Automation Society’s Distinguished Service Award for his “distinguished service and contributions to RAS industrial and humanitarian activities”. R. Madhavan, Humanitarian Robotics and Automation Technologies: Improving the Quality of Life for Humanity, International Journal of Advanced Robotic Systems, Highlights, pp. 50-52, June 2015. E. Prestes, J. Carbonera, S. Fiorini, V. Jorge, M. Abel, R. Madhavan, A. Locoro, P. Goncalves, M. Barreto, M. Habib, A. Chibani, S. Grard, Y. Amirat and C. Schlenoff, Towards a Core Ontology for Robotics and Automation, Robotics and Autonomous Systems, Elsevier, Vol. 61, Issue 11, pp. 1193-1204, 2013. T. Furukawa, L.C. Mak, H. Durrant-Whyte and R. Madhavan, Autonomous Bayesian Search and Tracking, and its Experimental Validation, Advanced Robotics, Vol. 26, Issue 5-6, pp. 461-485, 2012. R. Madhavan, E. Tunstel and E. Messina (Eds. ), Performance Evaluation and Benchmarking of Intelligent Systems, Springer Publishers B.V., 338 pp., Hardcover, ISBN: 978-1-4419-0491-1, 2009. R. Madhavan, C. Scrapper and A. Kleiner (Eds. ), Special Issue on Characterizing Mobile Robot Localization and Mapping, Autonomous Robots, Vol. 27, No. 4, pp. 309-481, 2009. R. Lakaemper, N. Adluru, L. Latecki and R. Madhavan, Multi Robot Mapping using Force Field Simulation, Journal of Field Robotics, John Wiley & Sons, Inc., Vol. 24, Issue 8-9, pp. 747-762, 2007. R. Madhavan, E.R. Messina and J.S. Albus (Eds. ), Intelligent Vehicle Systems: A 4D/RCS Approach, Nova Science Publishers, Inc., ISBN: 1-60021-260-3, 2006. R. Madhavan, T. Hong and E. Messina, Temporal Range Registration for Unmanned Ground and Aerial Vehicles, Journal of Intelligent and Robotic Systems, Springer Science & Business Media B.V., Vol. 4, No. 1, pp. 47–69, Sept. 2005. R. Madhavan, K. Fregene and L.E. Parker, Distributed Cooperative Outdoor Multirobot Localization and Mapping, Autonomous Robots (Special Issue on Analysis and Experiments in Distributed Multi-Robot Systems), Vol. 17, Issue 1, pp. 23–39, 2004. R. Madhavan and H. Durrant-Whyte, Natural Landmark-based Autonomous Navigation using Curvature Scale Space, Robotics and Autonomous Systems, Vol. 46, Issue 2, pp. 79–95, Elsevier, 2004. Humanitarian Robotics and Automation: Application of applied systems engineering methodologies for improving the quality of life for humanity; Development and deployment of robotics technologies in underserved and underdeveloped communities across the globe in collaboration with non-profit and non-governmental organizations; Sustainability of envisaged solutions by leveraging existing and emerging technologies and working closely with stakeholders including industry, academia, government, and end-users. Performance Evaluation, Benchmarking, and Standardization of Intelligent Systems: Testing and Evaluation of intelligent robotic systems via standard test methods and performance metrics; Development of objective and quantitative schemes for assessment of robot navigation; Standardization of robots and robot systems operating in complex environments; Design of environments and data capture techniques for ground truth referenced datasets using different sensor modalities with emphasis on data requirements and map representations; Field exercises, in-situ testing, and data collection in relevant environments by collaborating with vendors, developers, and end-users. Mobile Robotics: Extensive theoretical background and practical experience with guidance, navigation, image processing, and control schemes for unmanned ground and aerial vehicles in large complex, outdoor, highly unstructured environments; Mobile robot kinematics and dynamics; Localization and navigation algorithms; GPS/INS integration; Signal processing and machine vision; Information-theoretic performance metrics for intelligent systems; Moving object prediction, tracking and estimation in dynamic environments; Statistical pattern recognition and computer vision algorithms; Statistical analysis of the performance and confidence of the algorithms; Multi-scale signal analysis. Sensing and Perception: Laser/LADAR ranging, infra-red, GPS and INS in autonomous navigation of land vehicles and distributed heterogeneous sensing in cooperative land vehicle applications; Experience with signal conditioning and use of a variety of sensors and actuators including DC servo motors, encoders, strain gages, and piezoelectric gyros. Sensor Data Fusion: Numeric and geometric data fusion using estimation theoretic concepts (Kalman filtering, Bayesian); covariance analysis; sensor and data modeling methods; decentralized and distributed estimation and control; applications in robotics. Systems and Control: Control systems design, simulation, and implementation with both conventional and intelligent soft-computing tools; Experience with digital real-time control systems; Linear and nonlinear systems analysis and control; System identification and parameter estimation; Digital control and implementation issues; Sampling and finite word-length considerations for sensor-based robotic control. Amrita University will be hosting the inaugural International Conference on Robotics & Automation for Humanitarian Applications December 18 - 20 in Amritapuri.